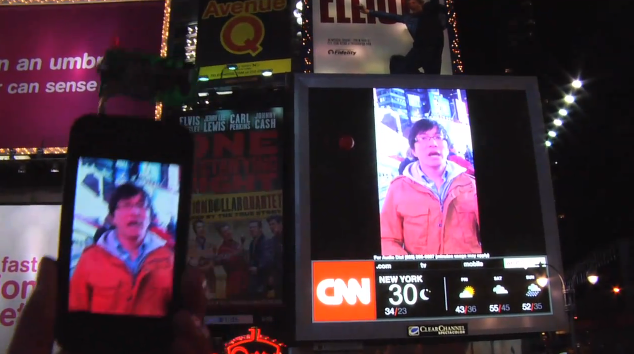 Times Square screens hacked using iPhone ! "The way it works is pretty simple: plug in my transmitter into the headphone minijack of an iphone 4 and play back any video clip. you can play it through the ipod feature or through the camera roll. the transmitter instantly sends the video signal to the video repeater and the video repeater overrides any video screen that it's being held next to. it doesn't matter what shape or size the hacked screen is because the hack video will simply keep its correct dimensions and the rest of the hacked space will stay black. i chose times square for my demo because it has lots of video screens to try it on. it is also one of the most monitored and secured areas in new york city and that made it that much more fun :). you can see in my video that the repeater is pretty powerful but the signal is not very stable yet. i'm working on that. i will post a new video later this week explaining how i made this prototype." - he says.